I recently got my hands on a couple pairs of Plantronics BackBeat Go headphones. After I've had a good amount of time to really cuddle and get to know them, this is my small review giving you my 2 Cents. So lets get the negatives out of the way first. 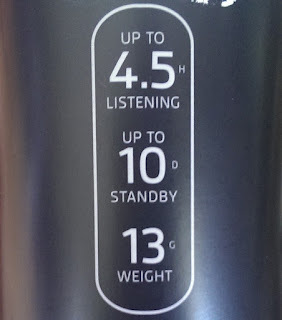 Number 1 straight out of the gate that people complain about including myself is battery life, only 4 hours at a high volume for these headphones. A little understanding has to come from the people using this. I explained to a few people at my work, if the battery lasted 12 hours like they all wanted, these headphones wouldn't be as small as they are now due to having to house the battery some place. After explaining to them, they soon understood the lack of battery. These aren't meant to get you through a full work day, but rather get you through a nice bike ride or a hard long workout at the gym. Because the battery of these headphones are stored within the ear bud housing, these are a little larger than the normal headphones you'd normally wear. Because of the enhanced size, having the headphones fit without falling out of your ears takes a little playing around with. You have to figure out what ear nub sizes fits best and if you should use the included fitted loops that are included to help keep them in your ears. Once you find comfortable style of wearing them and the right ear size, they are fairly comfortable to wear. Clearly smaller ones feel and fit nicer. These headphones are only approximately a foot long or so, which makes these an amazing travel companion as they fit in any pocket or bag without getting tangled or in the way. Plantronics includes 3 sizes of ear nubs along with optional loops that fit inside your ear to aid them staying in your ear without falling out so easy if you're having issue with that. Charging the headphones only takes about 2 hours and uses a MicroUSB which is amazing, being it uses the same fitting as your Android Phone, portable chargers and USB data cables are always available for a quick top up when you need charge. 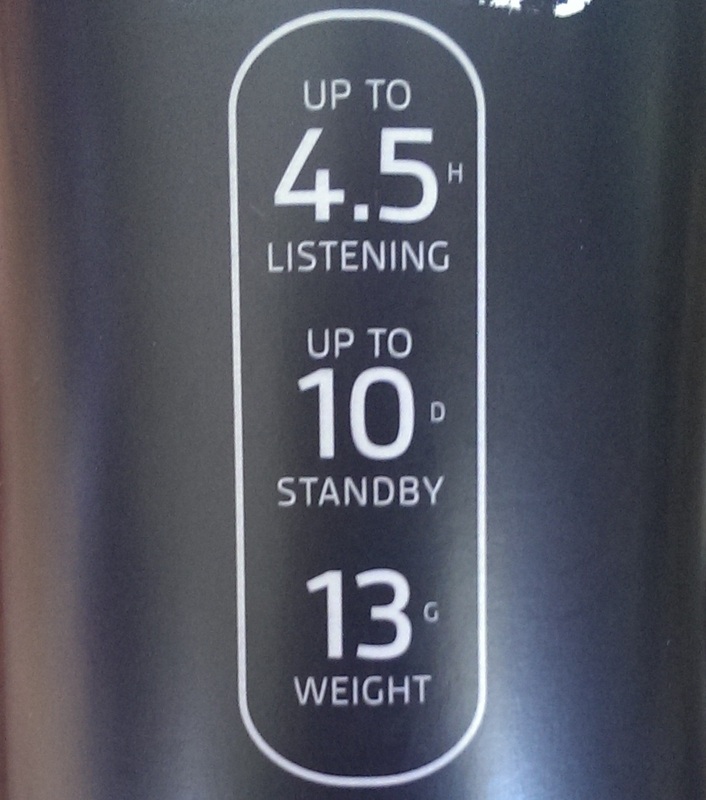 I'd call the sound quality above average for sound quality. The BackBeat Go Headphones are clearly a step above other in ear wireless headphones, but they are definitely not going to replace your Bose, or Dre Beats high end headphones. Easy accessible buttons with simple controls make these headphones easy to get along with, even if you're not a tech savvy person. You got your Volume Up/Down buttons, if long pressed also skip tracks. Play/Pause button, if long pressed allows you to place a call by speaking a contact name. Last but not least is your power button, and a 5-10 long press while the headphones are off initiates the pairing process to your phone. The BackBeat Go's have a built in microphone as well, so you'll never have to worry about fiddling with them when a call comes in. Though these BackBeat Go headphones are pretty outstanding, I don't think they are worth the retail price of $129.99, However they are totally worth the eBay price I paid of $60. I'd not pay more than $99 for these headphones, but they are totally a must have for someone who wants to go wireless without sacrificing sound quality during their daily travels. I bought my pair on eBay, and here's the link to that. However, the price has gone up nearly $20 since I bought mine, so perhaps you'd want to scout out other deals before purchasing the one from the seller linked here. 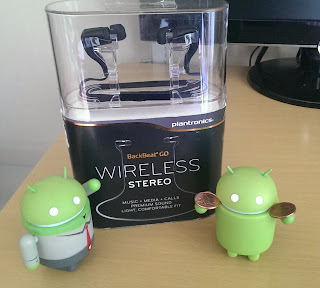 So that's my 2 Cents on the Plantronics BackBeat Go Wireless Headphones. If you can find it for less than the overpriced retail price of 129.99, you'll be very happy with them. If you have any questions of concerns about these headphones, feel free to post them in the comments below and I'll do my best to clear any questions up.